Stronger, more frequent ocean storms, and “flashier” river flows may change sediment delivery and distribution patterns in the Coos estuary. Changes in the distribution of estuarine sediment may affect plant and animal communities throughout the estuary. Increases in sediments delivered to the Coos estuary may help local tidal marshes keep pace with sea level rise. Areas of increased sedimentation may affect developed areas in the estuary, potentially resulting in, greater demand for commercial shipping channel dredging. In the future, precipitation in coastal Oregon is expected to remain a predominately wintertime phenomenon (i.e., most precipitation will continue to occur in the winter). However, the extent to which precipitation timing, frequency and intensity on the Oregon coast may change remains uncertain. and animal communities respond sometimes unpredictably to changing sediment conditions (Day et al. 2008). Distribution of sediments is largely determined by tidal and non-tidal hydrologic mechanisms that transport materials to the estuary from the ocean or watershed (Day et al. 2008). Climate-related hydrologic shifts (i.e., changes to water movement, such as river discharge, ocean inundation, storm surges, estuary flushing, etc.) will likely result in some variations in sediment distribution in the estuary. While we cannot conclusively forecast changes in sediment distribution in the Coos estuary, we can develop some reasonable sediment change scenarios based on likely climate-related changes in local tidal and non-tidal hydrology. Climate change is expected to affect precipitation patterns that control the timing and intensity (and perhaps the quantity) of freshwater contributions to estuaries from coastal rivers and streams. For example, a climate model of a coastal watershed in British Columbia (where the wintertime rainy season is expected to shorten and intensify, extending summertime drought conditions) predicted increases in fall/winter surface water runoff (frequently to flood levels) coupled with increased dependency on groundwater during dryer spring and summer seasons (Loukas et al. 2002). Similar trends are anticipated in Oregon, where climate change may result in decreased summer precipitation and more intense rain events in the winter (Mielbrecht et al. 2014, Oregon Climate Change Research Institute [OCCRI] 2010). Higher peak flows in streams and rivers during the winter season are likely to increase sediment input to the lower watershed from terrestrial sources (Defenders of Wildlife and ODFW 2008, OCCRI 2010, Scavia et al. 2002, Cannon et al. 2010, Goode et al. 2012). The opposite is true of low river and stream flows during anticipated extended drought periods of the summer months. Figure 1. Comparing sand movements due to seasonal wave directions along the beaches between rocky headlands of Oregon’s littoral cells. 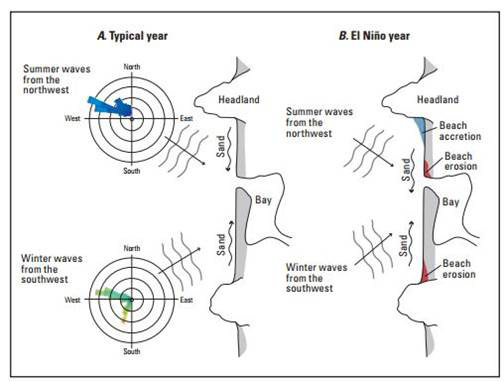 During typical years (A) seasonal sand movements are approximately balanced in both directions (equilibrium) whereas during major El Niño events(B), the waves transport greater volumes of sand northward, resulting in zones of accumulation (blue shading) and hotspot erosion (red shading). Figure: Ruggiero et al. 2013. In years with particularly intense winter storms (e.g., El Niño years), the northward displacement of sediment within each cell may result in beach accretion (i.e., sand accumulation) at the northern headland of the cell and the creation of erosion “hot spots” at the southern headland (Ruggiero et al. 2013)(Figure 1). Ruggiero et al. (2013) further explain that intense winter storms crossing the Northern Pacific ocean typically make landfall in the Pacific Northwest latitudes (i.e., 42°N to > 48°N) and sometimes achieve hurricane force wind speeds, spanning areas large enough to affect the entire length of the Pacific Northwest shoreline. Climate change experts report these storms may have become stronger since the 1970s, suggested by statistically significant increases in both wind speeds and average wave height on the Oregon coast (OCCRI 2010, Ruggiero et al. 2013). More intense winter storms may favor the southward displacement of coastal sediment within littoral cells (Ruggiero et al. 2013). As a consequence, the headlands at the northern ends of these cells (e.g., Cape Arago) may become erosion “hot-spots” (OCCRI 2010, Ruggiero et al. 2013). In addition, portions of the lower Coos estuary that are currently protected from wave erosion may become increasingly affected by ocean storms (winds and associated waves), causing shifts in sediment distribution in the lower estuary. These changes may be compounded by tidal current-generated modifications to estuarine bathymetry, which can work to focus or spread wave energy and further modify local and regional coastal sediment transport regimes (Scavia et al. 2002). Sea level rise (SLR) has the potential to result in the loss of wetland habitat and associated ecosystem services (e.g., flood control, maintenance of estuarine water quality, and carbon sequestration)(OCCRI 2010, Zedler and Kercher 2005). Experts anticipate that continued SLR may cause substantial wetland loss on the southern Oregon coast. Forecasting tools suggest that the Bandon Marsh National Wildlife Reserve (NWR), for example, may lose between 19-92% of its wetland habitat by 2100, depending on the SLR scenario used (Clough and Larson 2010 as cited from OCCRI 2010). Coastal wetlands can persist if the rate of vertical growth or “accretion” keeps pace with SLR (Cahoon et al. 1995, Day et al. 1995, Pont et al. 2002). Experts forecast that in Oregon the rate of SLR will increase over the next 100 years, suggesting that SLR may threaten tidal wetlands unless accretion rates grow as a result of climate-related changes including SLR (OCCRI 2010)(see local sea level rise rates in sidebar). Sediment accretion rates are determined by coastal watershed and estuary sediment transport processes (see Geomorphology, Hydrology, and Sediment Transport)(Cahoon et al. 1995; Day et al. 2000, 2003). Climate change may increase accretion rates in some parts of the estuary (e.g., those projected to receive more sediment from potentially higher wintertime peak flows). Conversely, rates may decrease in other areas (e.g., in the lower bay where higher waves and more intense marine storms may cause more erosion). 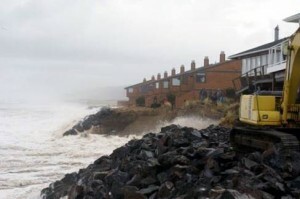 Rates of sediment accretion may also be affected by coastal development. Scavia et al. (2002) explain that coastal wetlands are able to “retreat” from SLR in undeveloped low-lying areas by migrating inland (also known as “landward migration of tidal wetlands”). They also note that wetlands could be lost in cases where landward migration is prevented by development such as constructed levees, seawalls, bulkheads, etc. Sediment transfer to and from estuaries is also facilitated by natural processes in the ocean. On the Oregon coast, sediment is transferred within “littoral cells,” which are stretches of beach bounded by rocky headlands (Ruggiero et al. 2013, OCCRI 2010, Revell 2001)(Figure 1). There are 18 littoral cells along the Oregon coast (Ruggiero et al. 2013). The characteristics of these cells vary widely in along-shore length, geometry, and capacity to act as a buffer between storm waves and the backing dunes or sea cliffs along which infrastructure may be located (OCCRI 2010). 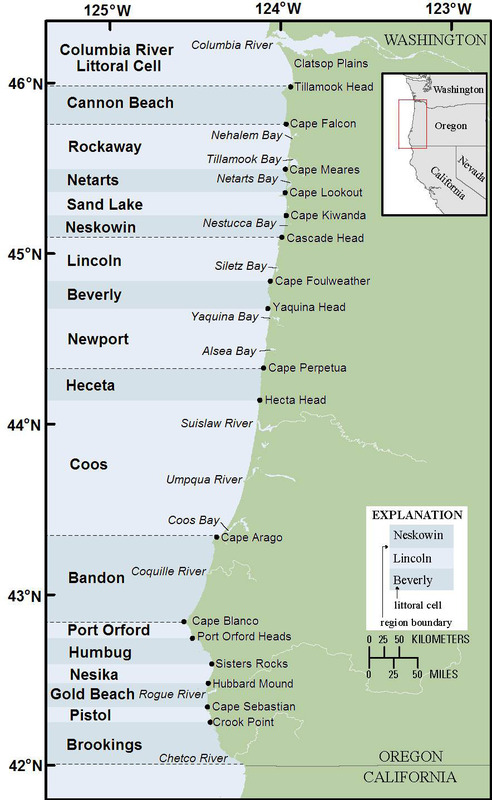 The Coos estuary is near the boundary of the Coos littoral cell (bounded by Heceta Head to the north and Cape Arago to the south) and the Bandon littoral cell (bounded by Cape Arago in the north and Blacklock Point in the south)(Revell 2001)(Figure 2). The Coos littoral cell contains the Coos Bay dune sheet. Stretching approximately 150 miles across the Oregon coast, the Coos Bay dune sheet is the largest coastal dune accumulation in the United States and represents a substantial source of sediment (Ruggiero et al. 2013, Revell 2001). Since the construction of the Coos Bay jetty in the beginning of the 20th century, coastal sediments have generally accumulated on the south side of the estuary mouth and erosion has occurred to the north (Ruggiero et al. 2013). The longshore transport of coastal sediments in Oregon follows a seasonal pattern. Ruggiero et al. (2013) explain that waves approach the shore from the southwest in the winter, pushing sediment northward within the littoral cell. The pattern reverses in the summer, when waves arrive primarily from the northwest and push sediment to the southern end of the littoral cell. In normal years, an approximately equal volume of coastal sediment is transported during each season so that the shoreline maintains a nearly balanced equilibrium as sediment oscillates within each littoral cell (OCCRI 2010). Increased intensity of winter storms may also produce more turbid water (i.e., more suspended fine sediments). In the lower estuary, seasonally higher waves and wind speeds will re-suspend estuarine sediment, while in the upper estuary, increased river flows during intense winter precipitation events will have the same effects. Contaminants that enter estuaries are often adsorbed onto suspended particles that eventually settle into estuarine depositional basins (USEPA 2002). Since suspended sediment fines (i.e., silt and clay) can act as “ligands” for contamination, climate change may facilitate more contaminant transferals between sediments and the estuarine water column, ultimately facilitating contaminant transport into other parts of the estuary. Climate-driven changes are expected to alter sediment deposition and erosion patterns, resulting in complex biotic responses that are “mediated by a network of biological interactions” (Day et al. 2008). Although the exact biotic response to changing sediment conditions is unknown, previously conducted research provides some clues. In the upper estuary, increased sedimentation from intense winter precipitation events and higher peak flows is likely to further limit the suitability of fish spawning habitat (ODFW 2014, USEPA 2012). Sediment conditions often associated with climate change may also favor parasitic hosts of harmful bacterial diseases in native salmon species (e.g., Ceratomyxa shasta in the ploychaete worm host, Manayunkia speciosa)(OCCRI 2010). Alterations to estuarine habitat may also affect plant communities that facilitate critical ecosystem functions. For example, excessive sediment in the water (e.g., from intense winter storms) combined with rising sea levels may block sunlight from reaching eelgrass beds which function as forage and refuge habitat for many commercial and recreationally important fish and shellfish species, particularly in their juvenile stages (USEPA 2012). Changes to estuarine sediment may also affect human infrastructure. For example, increased sediment in storm run-off may affect water treatment facilities (Miller and Yates 2007 as cited from OCCRI 2010). Port facilities including Coos Bay’s commercial shipping channel may be subject to alterations by more frequent and stronger winter storms, allowing for more sediment to enter the estuary from the ocean. They could also be affected by greater sediment delivery from the Coos river, which would result in the need for more frequent shipping channel and boat basin dredging (OCCRI 2010). Day, J. W. Jr., D. Pont, P.F. Hensel, and C. Ibañez. 1995. Impacts of sea-level rise on deltas in the Gulf of Mexico and the Mediterranean: the importance of pulsing events to sustainability. Estuaries 18: 636–647. Day, J., N. Psuty, and B. Perez. 2000. The role of pulsing events in the functioning of coastal barriers and wetlands: Implications for human impact, management and the response to sea level rise. In Concepts and Controversies in Salt Marsh Ecology, eds. M. Weinstein, and D. Dreeger, 633–660. Dordrecht, The Netherlands: Kluwer Academic Publishers. Day, J.W., A. Yáñez-Arancibia, W.J. Mitsch, A.L. Lara-Dominguez, J.N. Day, J.Y. Ko, R. lane, J. Lindsey, and D. Zárate-Lomelí. 2003. Using ecotechnology to address water quality and wetland habitat loss problems in the Mississippi basin: a hierarchical approach. Biotechnology Advances 22: 135–159. Day, John W., Robert R. Christian, Donald M.
Boesch, Alejandro Yáñnz-Arancibia, James Morris, Robert R. Twilley, Larissa Naylor, Linda Schaffner, and Court Stevenson. 2008. Consequences of climate change on the ecogeomorphology of coastal wetlands. Estuaries and Coasts, 31(3), 477-491. Goode, J. R., C. H. Luce, and J. M. Buffington. 2012. Enhanced Sediment Delivery in a Changing Climate in Semi-Arid Mountain Basins: Implications for Water Resource Management and Aquatic Habitat in the Northern Rocky Mountains. Geomorphology 139-140: 1-15. doi: 10.1016/j.geomorph.2011.06.021. Loukas, A., L. Vasiliades, and N. R. Dalezios. 2002. Potential climate change impacts on flood producing mechanisms in southern British Columbia, Canada using the CGCMA1 simulation results. Journal of Hydrology, 259(1), 163-188. Mielbrecht, E., J Weber, C. Swenson, D. Patte, and S. Denney. 2014. 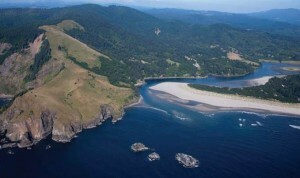 Coquille Estuary Climate Change Vulnerability Assessment. EcoAdapt/US Fish and Wildlife Service report. 79 pp. National Research Council. 2012. Sea-Level Rise for the Coasts of California, Oregon, and Washington: Past, Present, and Future. Washington, DC: The National Academies Press. 201 pp. Oregon Department of Fish and Wildlife (ODFW). 2014. Coastal Multi-Species Conservation and Management Plan. Unpublished Manuscript. Pont, D., J. Day, P. Hensel, E. Franquet, F. Torre, P. Rioual, C. Ibañez, and E. Coulet. 2002. Response scenarios for the deltaic plain of the Rhône in the face of an acceleration in the rate of sea level rise, with a special attention for Salicornia-type environments. Estuaries 25: 337–358. Zedler, J. B. and S. Kercher, (2005), Wetland resources: Status, trends, ecosystem services, and restorability, Annual Review of Environment and Resources, 30, 39-74.